Family Health Bureau Consultant Community Physician Dr. Kapila Jayaratne, Consultant Respiratory Physician Dr.Keerthi Gunasekara, Consultant Physician Dr. Anula Wijesundare, and Consultant Physician Dr. Panduka Karunanayake in the ceremony. 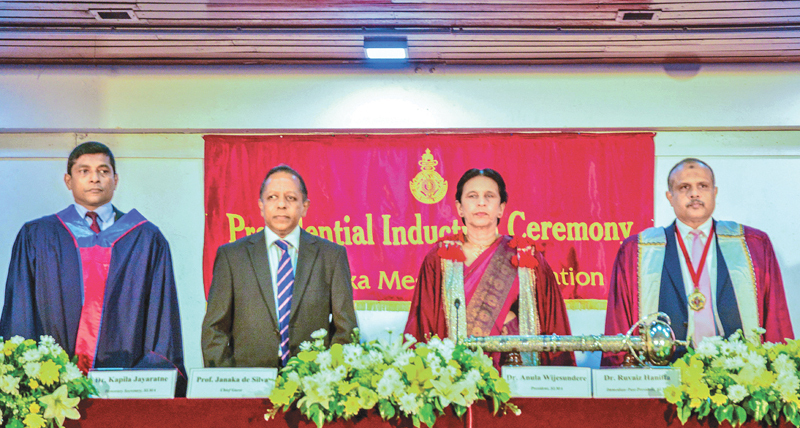 Consultant Physician Dr. Anula Wijesundare was inducted as 122nd President of the Sri Lanka Medical Association (SLMA) by Dr. Ruvaiz Haniffa, the outgoing President, during a ceremony held at the Sri Lanka Foundation Institute (SLFI) in Colombo recently. Dr. Anula Wijesundare is a past pupil of Visakha Vidyalaya, Colombo. She was the Consultant Physician at the Sri Jayewardenepura Hospital and founder Professor of the Kotelawala Defence University. Dr. Wijesundare was also the former President of the Ceylon College of Physicians in 2001. Dr. Panduka Karunanayake, Consultant Physician and Senior Lecturer at the Faculty of Medicine, University of Colombo and Dr. Keerthi Gunasekara, Consultant Respiratory Physician were elected as SLMCA Vice Presidents. Consultant Community Physician of the Family Health Bureau, Dr. Kapila Jayaratne, appointed as SLMCA Secretary for 2019.